In a medium bowl, whisk together flour and salt. In a large mixing bowl, beat together butter and sugar until completely combined. Add dry ingredients and mix until just combined. Scoop mixture into a 9" square baking pan lightly coated with cooking spray - press dough over the bottom to form the crust. Place into the oven and bake until pale golden, about 30 minutes. Remove and let cool while you prepare the filling. In a medium saucepan, add condensed milk, brown sugar, butter, syrup and salt - heat over low, stirring, until sugar dissolves. Bring mixture to a boil and cook, stirring constantly, until mixture darkens and reaches 237 degrees on a candy thermometer. Remove from the heat and whisk for 30 seconds. Pour mixture evenly over the cooled crust. Immediately scatter hazelnuts over the filling, pressing in lightly to adhere. Set aside and allow to cool. Add bittersweet chocolate into a microwave safe bowl - place into the microwave and heat on 50% power, stirring every 30 seconds, until just melted. Pour over hazelnuts and spread to cover. Repeat process with white chocolate - drizzle lines of white chocolate all over the top. Allow to cool before cutting into squares. Just found the recipe? Click here to see where we talked about it! Whoa. Those bars look absolutely delicious! 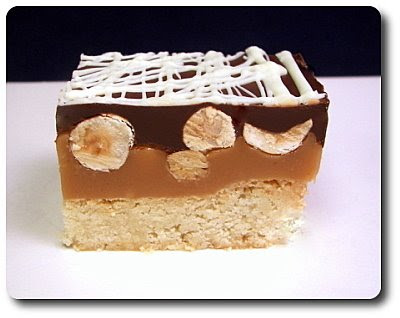 At first I though the shortbread was actually a rice krispie treat base. I wonder if it would be possible to use that instead! Alexandra - thats an interesting suggestion... I'm not sure how they would work, but it is worth the experiment I think. This fairly old post gave me the idea for a suberb, but decadent, dessert. Instead of caramel I made a peanutbutter-cheesecake-filling which I baked together with the shortbread. I added some cream and nougat to the topping and served it with a bit of sweetened condensed milk on the plate. A real sin for all the peanut butter lovers out there. If you would like to find out more about why we are writing about our food journey please check out this post. Want to ask me a question? Click here to e-mail us!